In July, we embarked on our annual trip to Haiti with a spin. Instead of only focusing on our usual, women, we had men, lots of men on campus throughout the week. A couple of years ago, the women we had been training started sharing of their desires to have their husbands undergo the same trainings they'd been receiving. We had no idea how that would be possible. And at the same time, we started running out of training ideas for the women. We had taught on almost every topic dealing with trauma; shame, guilt, child abuse, domestic violence, self-care, spiritual growth and more. We were fresh out of ideas. With the women’s prompting, we decided this year, not only will we address the women through our usual conference; we will also address the men through a marriage conference. 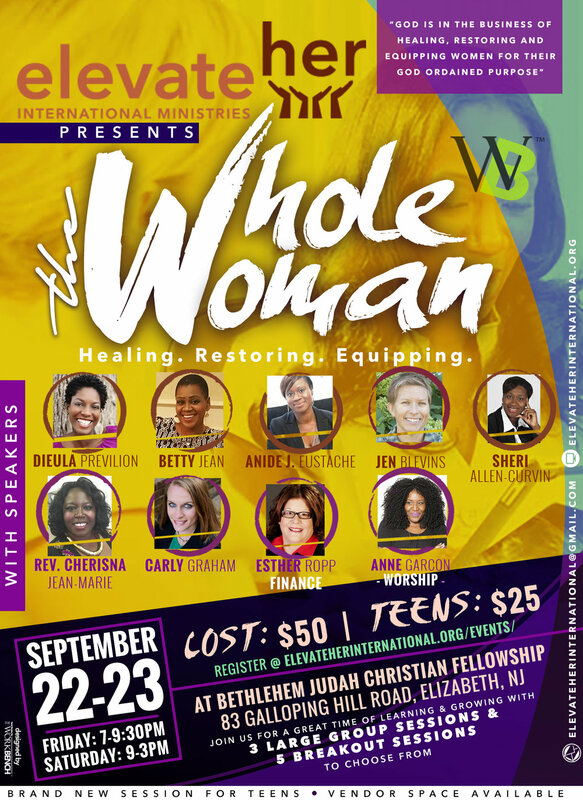 “This year’s Women’s Trauma Conference theme was “The Whole Woman”. For two days, we gathered with 200+ women in morning and afternoon sessions, to explore the whole woman. We were also able to host their children in a Kids Camp thanks to the help of Fresnel, Devin & Justin Previlon, and the entire LakePointe Church team, from Texas. We started off the conference by asking the women to call-out their idea of "the whole woman". We heard “Yon Fanm Brode” (All Put Together Woman), “Yon Fanm Spirityel” (A Spiritual Woman),” Yon Fanm Vanyan” (A Strong Woman), “Yon Fanm ki gen Kouray” (A Courageous Woman), and the best “Yon Fanm Total Kapital!!! !” (The Total & Ultimate Woman). When we asked how many of them identified with either of those ideals, sadly not many of the women present raised their hands. Needless to say, we had work to do!!!! During the next 2 days, Dieula, Anide and I set out to explore who was the Whole Woman based on scripture. We explored The Samaritan Woman, The Woman with the Issue of Blood, The Meaning of Wholeness, How to Make Decisions and more. On the last day, we hosted a panel discussion, where Dieula Previlon, Anide J. Eustache, Jennifer Blevins and I each got the chance to share with the women about a personal/family struggle when we didn’t feel whole and how we made it through. The women are so used to seeing us ministering as teacher, but have never really heard the fullness of our individual stories. For me, it was a humbling opportunity to share woman to woman, believer to believer, about the times that I felt most vulnerable and afraid, even as a spiritual leader and professional. Our stories are what make us human. They connect us one to another. Our stories have the power to bring hope to others. Our testimonies can speak life to those who are in the darkest of places. I feel more whole today because I got to share a piece of myself with my sisters in Haiti”. The whole woman is not about having it all together or having it all figured out but it’s about living a life of faith. It is a life that is defined by making Christ the center of our lives. “After the Women’s Conference portion of our Trauma Conference had concluded, we launched our first Marriage Conference. We registered close to 100 couples and 30 single women from the Gressier community and we had a great time! Our speakers came from far and near, Pastor Caleb Lucien with Hosean International Ministries, mostly lives in Haiti, Anne Garcon & Irventz Garcon from Brooklyn, NY and Pastor Kenslio & Marriele from NJ New Jerusalem Baptist Church; sharing their hearts and challenging couples to do marriage God’s way. For many of the couples and singles, this was their first exposure to marriage and relationship teaching. We all learned together!! It seems that struggles in relationships are universal. I heard many of the same challenges in relationships that also exist in more wealthy nations. ElevateHer International's goal is to empower and equip local leaders to strengthen and equip those in their respective communities and churches to do life and relationships God’s way. So together we looked at “God’s Purpose for Marriage”, “Godly Roles in Marriage” “The Single Life of Purpose”, “The 5 Love Languages” “Marriage Mission Statements” and “Communication 101”. Because of our faithful financial contributors, we were able to provide a complete teaching manual and a hardy lunch for all who came! We ended our time together with the couples recommitting their lives one to another. We also had a special time of prayer and impartation for those who were single. Women's Conference Worship. Some of the best times of worship. Dieula teaching at the women's conference. Betty teaching at the women's conference. Our leadership team at the women's conference. Some of our women leaders present during the conference. One of the strategies we use in our training, in order to do a thorough job contextualizing and framing, is to ask our audience to tell us about their culture and how they experience a certain subject. To begin our marriage conference in Haiti last week, we asked the couples to tell us about the challenges marriages in Haiti were facing. The very first response they gave was economic challenges. Among other responses were: lack of affection, no time, infidelity, domestic violence, in-laws and on...If you can read creole, see the results in the pictures. Marielle and Kenslio Ojentis teaching on God's plans for marriage. We had a full crowd. There was so much fun and laughter. Panel discussion with all of our speakers. Many questions on submission especially as it relates to domestic violence. So Betty Jean started encouraging the couples to share a holy kiss with one another at the conference; of course they were all shy to do so. So Pastor Caleb Lucien joined her in encouraging them by selecting couples to share a holy kiss with each other. No one was safe, Anne Garcon and Irventz Garcon, Marielle and Kenslio Ojentis, Fresnel Previlon and I. We spent a good 20 minutes just having fun. There's pain and suffering but there's also room to laugh, rejoice and have fun. One of our singles posing beautifully. Women's Small group-Not so small group. A special time of prayer for the singles. My favorite part of the conference: the renewal of vows and rededicating the marriage ceremony. Our entire team! The best team ever. We are very excited that God has afforded us another opportunity to minister not only internationally but also nationally in the US in New Jersey. This will be our third conference in NJ. Please be in prayer as God continues to expand our territory. This year we carried our theme across cultures. 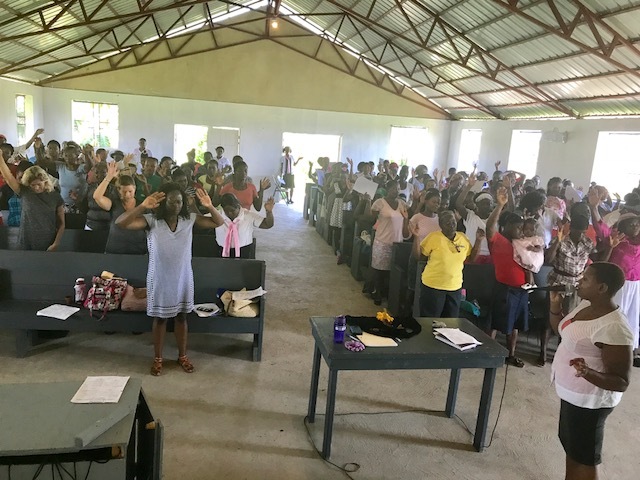 We taught in Haiti on what it means to be Whole and now for our NJ conference, we continue to challenge God’s daughters on the meaning of wholeness. The whole woman is not about women having it all together or having it all figured out but it’s about living a life of faith. It is a life that is defined on making Christ the center, the focal point of our lives. Please be in prayer for God to meet all of our needs. For the women attending to be fully present and ready for God to speak to them. And for all of the logistics to go according to plan. Yes, that's right. This fall we are launching continuing education trainings for professionals who work with people who have gone through some form of trauma or challenging event. That means every type of professional is welcome to attend. The pastor leading a church of broken people, the counselor seeing clients, the social worker with a huge caseload, the business executive leading a team; really anyone leading and working with people is invited to join us. Elevateher International Ministries continues to exist to empower and strengthen the kingdom of God by offering training to help God's children heal from trauma. So everything we do will be framed around the process of healing and living a life of wholeness. Our first training will be on Self-Care. See you all in the fall. More information to come. ElevateHer is 5 years old and we give thanks to God. He has done a mighty work in and through us. We give thanks to Him for allowing us to be where we are today. In five years we have touched hundreds of lives. In five years we have conducted dozens of training sessions. In five years we have made dozens of ministry partners. In five years the ripples are too many to count and too out of our control to see. In five years the greatest change that I can see is that God has changed us. We are no longer the same as when we first began. We now have a deeper purpose and an even stronger commitment to making God known by empowering women and developing communities. My husband, Fresnel, and I and our boys thank you. Thank you, for supporting us at this great feat. This has definitely turned to being a family affair. Your help and support have allowed us to do the many things we could have never accomplished on our own. My ministry partners, Betty and Anide, thank you for holding us up when we could not hold our self up through prayer. And thank you for the financial gifts that have allowed ministry to continue to advance. God is our source and he has allowed you to be used as our resources. Thank you. And thank you for the prayers that have sustained us thus far. In a ministry like ours, there are many days of discouragement but we thank God for prayer partners that have sustained us. Please continue to keep us in your prayers. Here's to the next 5 years, by faith.